Don't you love it when a hunch pays off? I had a hunch for how to create an easy DIY mayonnaise recipe – and after reading Amy Berger's ode to the deliciousness of Hellman's I decided that my recipe had to taste even better than Hellman's. A daring challenge? Oh yes. I can distinctly recall how Hellman's tastes – salty, creamy, savory, a little tangy, thick, and it makes everything it's paired with taste even better. 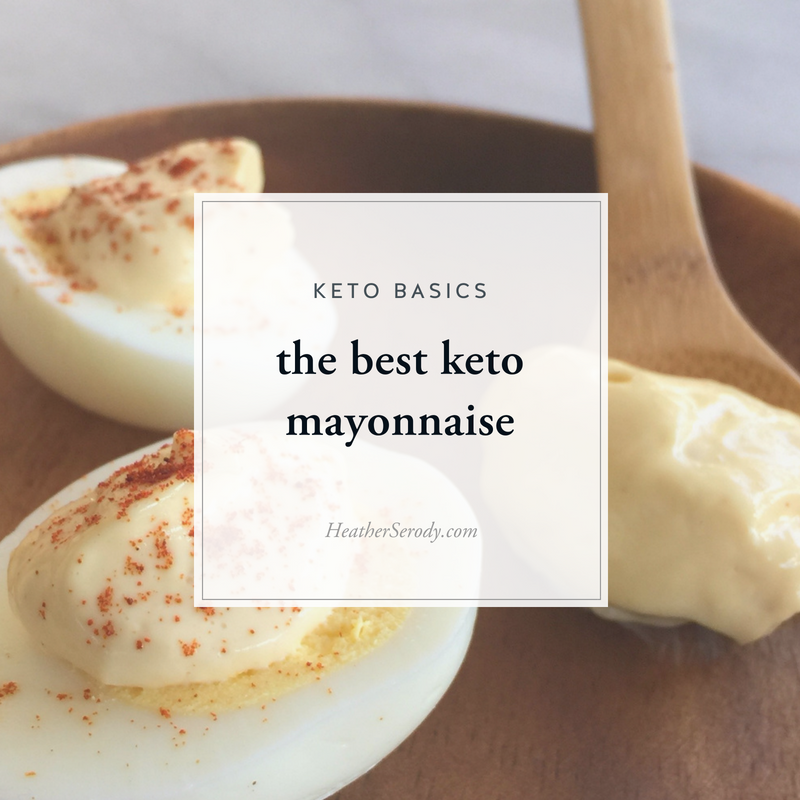 I did some tinkering in my kitchen and O-M-G, I'm not one for hyperbole, but this the best keto mayo I've ever had! But before I tell you how to make it I want to tell you why you should be making your own mayonnaise at home, whether you are eating ketogenic or not. why stay away from store-bought mayos? Made with inflammatory causing oils: The biggest problem is that most store-bought mayo is made with polyunsaturated oils like soybean or canola oil. Even mayo brands labeled as made with olive oil, are usually still predominately made with soybean oil (check labels!). These polyunsaturated fats have lots of double bonds in the molecular structure. Hang with me here… Not good because each double bond presents an opportunity to bond with oxygen…meaning it can become oxidized multiple times for each molecule. Oxidized oils cause an inflammatory response in the body, which over time can both cause other health problems and/or make conditions like diabetes, obesity, metabolic syndrome, autoimmune disease, cardiovascular disease, cancer, fatty liver disease, food sensitivities, and a whole host of other things that degrade your health. Are highly processed: In order to stabilize these inherently unstable oils, food manufacturers further process polyunsaturated oils in order to try to make them stable by winterizing, interesterifying & deodorizing them to just name a few. Do you really want to be eating oils that have been chemically altered so much? Why not just eat mayo made with a better oil? Added junk: Many shelf-stable mayos contain a whole host of things that you probably don't want to eat, like sugar, or chemical preservatives like calcium disodium EDTA to keep it from going bad on the shelf where it can sit for months. I hope that I've convinced you to never buy polyunsaturated oil-laden mayo again. Your body a temple too good for polyunsaturated fat, ‘mmkay? So, like I mentioned before, my hunch was to add a pinch of smoked paprika to make this keto mayo taste like mayo! It imparts a subtle savory punch of flavor to make this the best keto mayo E-V-E-R. It rivals the taste of really good store-bought mayo, (I think it's actually better-tasting) but with all the good fats and nothing artificial. Made with avocado oil – which is 70% monounsaturated fat (a much better choice to make mayonnaise with) that imparts great flavor, and gives lots of other nutritional benefits, too. So, get yourself some smoked paprika, because you just can't make the best keto mayo without it. Once you do, not only will you be making fresh mayo like a champ, but you'll be sprinkling it on your hard boiled eggs, avocado, stews, and anything else with good fats in it all the time. Add all ingredients to a high-powered blender and blend for 1 minute on high speed or until mayo is thickened and completely combined. Alternative: If you have a regular blender then just add everything to your blender except the oil. While the blender is running, pour the avocado oil in a slow stream until it thickens up - about 1 minute. I was wondering which oil you would recommend to replace the avocado oil? I have a food sensitivity to avocado. Hi, anonymous. The carb count isn’t listed because there isn’t any. ? Any keto recipe is incomplete without Carb measurement. I did some research on this and there is no one definitive answer. I keep it in a covered glass jar in the refrigerator (not on the door) for up to two weeks. A good rule of thumb is to use it for as long as the eggs you use are good. I hope that helps. I have never made mayo before . How long does this keep in the refrigerator and what do you use to store it in ? This recipe looks good, simple and easy, does it have to be grey sea salt? How many grams of carbs are in it? Should it be refrigerated afterwards and for how long? I am looking for a great mayo for my keto chicken salad and I just haven’t found one that i love but this recipe looks promising! Hi Jenna! Apple cider vinegar will work just fine, too. What can I use instead of champagne vinegar!? Hi, Amanda. Keto is short for ketogenic, which is a low carb, moderate protein, and high-fat way of eating. It is often used to control blood sugar, helps epileptics control seizures, and it’s great for fat burning! Looks like an amazing recipe! !